Advantages: A detailed look at a little-studied campaign, excellent artwork, many previously unpublished photographs, interesting text. The air campaign over Russia was massive. For any one book to cover it in sufficient detail would be a monumental task. The sensible alternative is to break up this theatre of operations into sections, and this is what the authors have done with this publication. Essentially the book describes the aerial operations that took place on the southern flank of the Eastern Front. 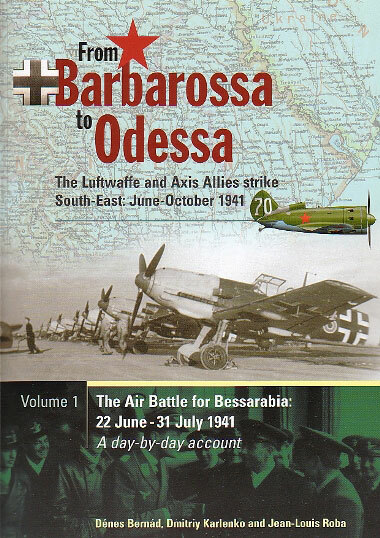 It is the first of a two volume set that covers the advance into Bessarabia and South-Western Ukraine following Operation Barbarossa. Therefore the period looked at is from 22 June 1941 to 16 October 1941, when Rumanian troops finally occupied Odessa, the region’s capital. Despite the intensity of the fighting, researchers have not given this theatre the close scrutiny it deserves. These bitter campaigns were a closely matched affair. It was here that local Soviet commanders used their initiative and dispersed their aircraft. This saved most of them from being destroyed on the ground, thus allowing the Red Air Force to use them effectively in the weeks to come. This large format publication contains 96 pages between soft card covers. Inside are nearly 100 black and white photographs. They display an interesting array of men and machines with many images being published for the first time. Some excellent pieces of artwork are contributed by Tim Brown. Apart from the half dozen aircraft profiles, he also provides the map which gives the reader a better understanding of the course of events. The layout of the book starts with the road that led to the German – Soviet war. We are introduced to the main combatants as well as to the Reich’s smaller allies. The state of play directly before the conflict is put into perspective before the book launches into to a detailed day-by-day description of operations. This section occupies the majority of the publication and takes the war to Thursday 31 July 1941, at which point the air war over Bessarabia officially ended. Volume 2 in this series will describe the events leading to Odessa. The book also looks at the often neglected involvement of the Slovaks, Bulgarians, Hungarians and Rumanians, the latter claiming over 600 aerial victories. The text is easy to understand and lively anecdotes abound, with one such example relating to the crew of a downed He 111. They managed to salvage a machine gun from their incapacitated bomber to fight off the Russians before swimming across a river to safety! A lot of research has gone into this book which is evident from the amount of detail it contains. Views from both sides of the conflict are conveyed to the reader and this is done with the help of eye-witness accounts from the pilots themselves. It’s certainly an entertaining read and one that puts this often neglected campaign back on the map.